Brittney Gigante used to eat a bagel or breakfast sandwich in the morning and grab takeout most days for lunch and dinner. “I didn’t know how to order healthy options, nor did I want to; I was totally out of shape,” said Gigante, 25, who weighed 155 pounds after graduating from Daemen College in 2016 with a bachelor’s degree in business administration. Gigante began strength training three years ago. 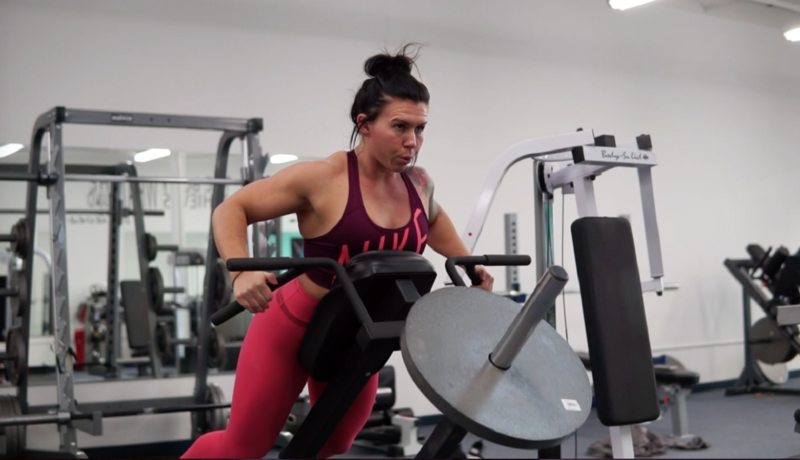 She became a personal trainer six months ago and, last month, opened Beast Unleashed Fitness at 3171 Eggert Road in the Town of Tonawanda, the municipality where she also lives. Beast Unleashed offers small group training classes, one-on-one and partner training sessions, and customized nutrition and supplement programs. Monthly memberships and day passes are available. For more information, visit beastunleashedfitness.com. Gigante has lost a dozen pounds since she started strength training and changed her diet – but her body composition is completely different. Q: What are the staples of your diet now? 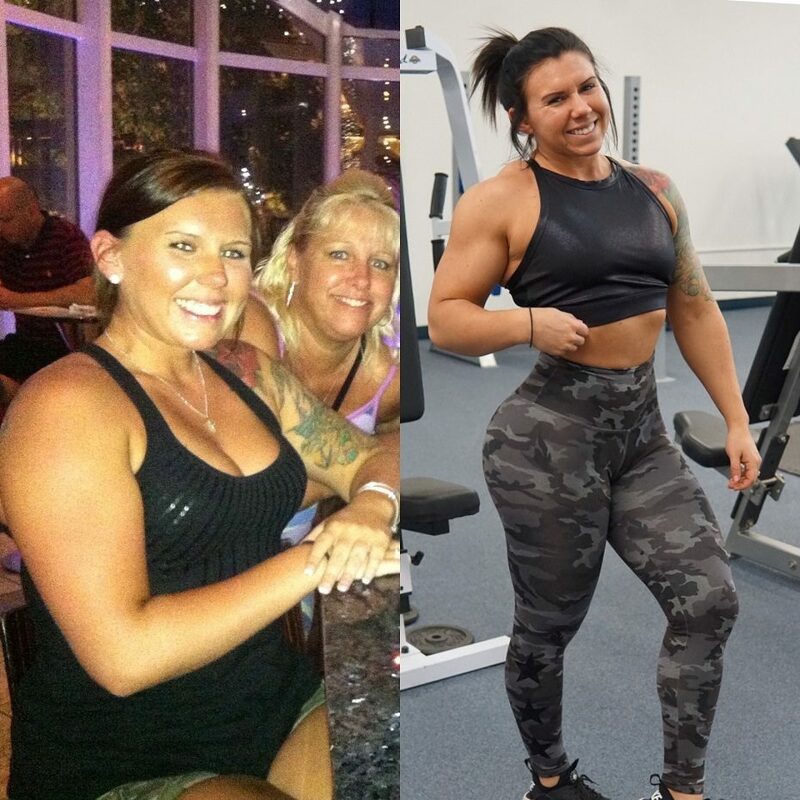 Brittney Gigante, far left and right, may only have lost 12 pounds as she changed her wellness ways, but she has transformed her body while boosting her physical and mental strength. It’s very simple and structured, but I like it that way. Breakfast is a protein shake and almonds, then around 11 a.m. I eat egg whites and oatmeal. Lunch is usually ground beef and sweet potato, then I’ll work out. I have a protein shake and banana after my workout. My last meal is whatever I’m in the mood for, usually protein waffles or something with fruit to curb my sweet tooth. Q: What was your fitness like before you started weight loss? In high school, I would go to the gym with my mom and just do cardio but then I would eat whatever I wanted afterward. I thought since I worked out, I could. But now I know that’s not how it works at all. I did that for a few years and wondered why I wasn’t losing weight or seeing the results I wanted. I started seeing girls on Instagram lifting weights and decided to try it for myself, and I’ve been addicted ever since. Q: What’s it like now? I work out six days a week and train a different body part every time. Monday, I do legs, Tuesday is chest, Wednesday is back, Thursday is legs again, Friday is shoulders, and Saturday is arms. I do cardio about three to four times per week after I lift weights. Q: What are the key changes you made to boost strength and help you lose weight? Incorporating weight training into my workout regimen. Doing cardio is good, but strength training is so important when trying to lose fat. Replacing pop and juice with water also made a huge difference for me. I aim to drink a gallon of water every day. Changing my diet played a huge role in my weight loss. Having a good ratio of macronutrients – carbs, fats and proteins – can make a huge difference in your body composition. I aim for about 150 grams of protein, 200 grams carbs and 50 grams of fat per day. Keep in mind that those are just for my body type, and someone who is 6 feet tall, 220 pounds would have totally different ratios. Q: What are the top benefits you’ve had from your strength training and weight loss? I’ve noticed a huge difference in my confidence. I used to be very self-conscious of my body but since lifting heavy and strength training, I have a whole new perspective. Fitness is about so much more than being strong and looking good – it’s about your mental health, as well, and strength training has definitely helped me mentally. Lifting weights teaches you work ethic. I believe having a great physique and being physically fit reflects your work ethic outside of the gym as well as in the gym. Q: What is the gym focus? Your fitness philosophy? My goal is to create an uplifting and positive environment of people who want to be the best possible versions of themselves. My gym will be a place you can go to be surrounded by people who want to help you and motivate you. Fitness is so much more than a physical transformation. It’s about building each other up and gaining the confidence you deserve. Q: What would you recommend to others who are thinking about losing weight? Start today. Don’t wait for a New Year’s resolution. Don’t wait until next Monday. Don’t wait until your vacation is four weeks away and you need to suddenly lose 50 pounds. Just start now. It is a lifestyle change. There are no secret pills or skinny tea or fad diets that are going to give you better results than hard work.